To say that Dora Castillo is a wonder woman with many talents is an understatement. She’s an architect, a contractor and a developer and she brings all these talents together in creating remarkable infill projects in Phoenix. Dora and her husband Rafael Castro, who is also an architect, have had a remarkable journey that brought them to Phoenix. 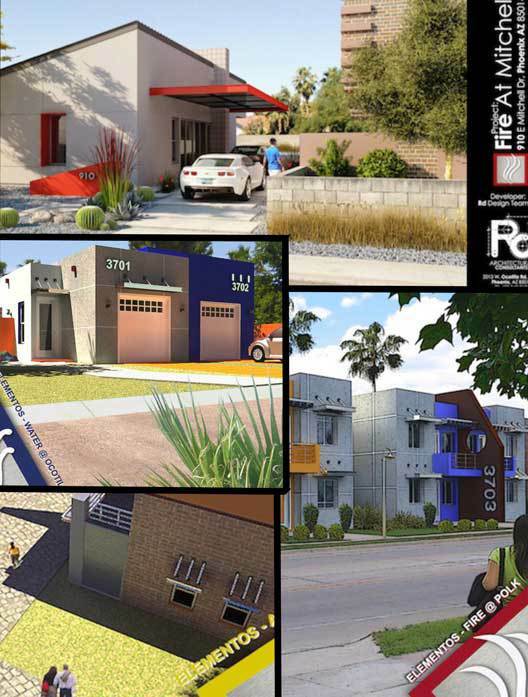 Currently, their firm, RD Design Team, is completing four infill housing project in Central Phoenix named after the elements, Fire at Mitchell, Fire at Polk, Water at Ocotillo and Air at Hayward. These infill projects are unusual and exciting because they are an expression of modern design, use sustainable building strategies and fulfill a social mission to improve neighborhoods. Dora and Rafael graduated from the Universidad Autonoma de Baja California in 1991. They had been working in the architectural field since 1988 and they started their own Design Build company in 1990. A couple of years later, their love for architecture inspired a months-long trip to Europe where they attended the Universal Exposition of Seville, which became the inspiration for their unique architectural style, – modernism with Spanish and Mexican influences. That same year in 1992, Dora and Rafael became developers, building their own projects financed by private developers. About six years later, Mexico underwent a terrible economic downturn, which decimated the construction industry. So the couple decided to make the move to the United States where Dora planned on getting her Masters of Interior Design in Phoenix. It turns out she never got that Masters because she was too busy getting her contractor’s license and her architect’s license and building their vertically-integrated development company – RD Design Team. Dora and Rafael have always been drawn to the clean lines of modernism and this is the style that they bring to their development projects. Recently they’ve collaborated with architect Scott Roeder (formerly of Merz Project), who is known for such great projects as the After Hours Gallery and for his metal work and furniture. Scott brings to the Fire, Water, Air projects distinct metal accents that pop and give the houses a striking street presence and a unique signature identity. Because of their background in construction, Dora and Rafael not only bring economic efficiencies to building these infill projects, they employ smart building strategies to make the homes more sustainable. They achieve an insulation rating of +-R-19 on the walls by using 2×6 framing with 2 inches of insulation on the inside as well as 2 inches of insulation on the outside from the synthetic stucco. RD Design Team’s infill projects sport a sleek metal roof with an insulation value of +-R-30. Metal roofs not only look great, but they are sustainable too because they have a high solar reflectance and a high thermal emittence. These two qualities can help a metal roof stay 50-60 degrees F cooler than a conventional asphalt shingle roof in the peak of summer. The home designs plan to incorporate as many efficient features as possible including Energy Star appliances, low-flow faucets, low VOC paint, 15 SEER HVAC units, water-efficient irrigation, dual-flush toilets and recycled fly ash in the concrete of the foundation and floor slab. Future projects will go through HERS testing as well as be certified by the National Home Builder’s Association. When I asked Dora why she is building infill projects in Phoenix when she could build much more cheaply on the outskirts of town, she responded by saying that they’re interested in making a positive impact on the neighborhoods in Central Phoenix. They know that well-designed homes bring pride to neighborhoods and encourage neighbors to improve their own homes, eventually raising home values in the entire area. And because of this, Dora and Rafael decided to put their talents towards helping existing neighborhoods in the city by developing infill projects on empty lots. The first project, Fire at Mitchell, located on 910 E. Mitchell Drive, is expected to be completed late February of this year. Target priced under $375,000. Jarson & Jarson is proud to exclusively represent the sales for these projects; Contact our office at 480.425.9300 or Scott@azarchitecture.com for more information.